In a noisy and fragmented ecosystem, advertisers and brands are in a seemingly never-ending race against technology. One of the most difficult technological hurdles is ad blocking. Ad blocking, often perceived as the wrecking ball that will destroy online advertising, is relatively common. An estimated 30 percent of all U.S. adults will use an ad blocker on one or more devices this year. If three in ten consumers are blocking ads, how can brands expect to reach these users? This is particularly true for millennials and Gen Z, who may be the core of their target audience. The answer requires advertisers to think more critically and strategically about why their audience is responding to ads with ad blockers. It also involves understanding what ad blocking really means, why and how consumers are using it, and what solutions brands can provide to avoid being a target of ad blockers. HOW DO YOU DEFINE AN “AD BLOCKER”? It is important to note that not all ad blockers have the same capabilities or were designed with the same intention. Ad blockers can be bucketed into two categories: user-enabled and in-browser. The most common type of user-enabled ad blockers come in the form of browser extensions. The most common type of user-enabled ad blockers come in the form of browser extensions. All major browsers on both Mac and Windows devices allow for add-on ad-blocking capabilities that can remove or limit the number of advertisements a user sees. These blockers follow a set list of rules that counteract the ad code by blocking all potentially malevolent ads, restricting ad units and sizes, and sometimes interrupting communication between a user’s browser and the ad server. Essentially, they can prevent an ad call by halting the ad from downloading on the page in the first place. And while ads that aren’t served aren’t counted as impressions that advertisers must pay for, the irony here is that major publishers such as Google and Microsoft are simultaneously selling ad space and reducing their own inventory through these ad blockers. For example, Google recently introduced ad filtering software that is baked into Chrome and aims to block intrusive ads not following the Coalition for Better Ads’ Better Ads Standards. This set of standards aims to improve the quality of digital advertisements by outlining best practice guidelines for sites and advertisers. The coalition cautions advertisers against using ad formats on their list of least-preferred ad experiences, including: pop-ups, auto-playing video with sound, prestitial ads that load before page content, large sticky ads, full-screen scroll-over ads, ads that take up more than 30 percent of a page’s height, and flashing animated ads. The Google Chrome filter aims to eliminate these “annoying” ads and encourage brands to follow guidelines that provide a better user experience. Google is sending a clear message here: high-quality ads are better for everyone, including users, advertisers, and publishers. 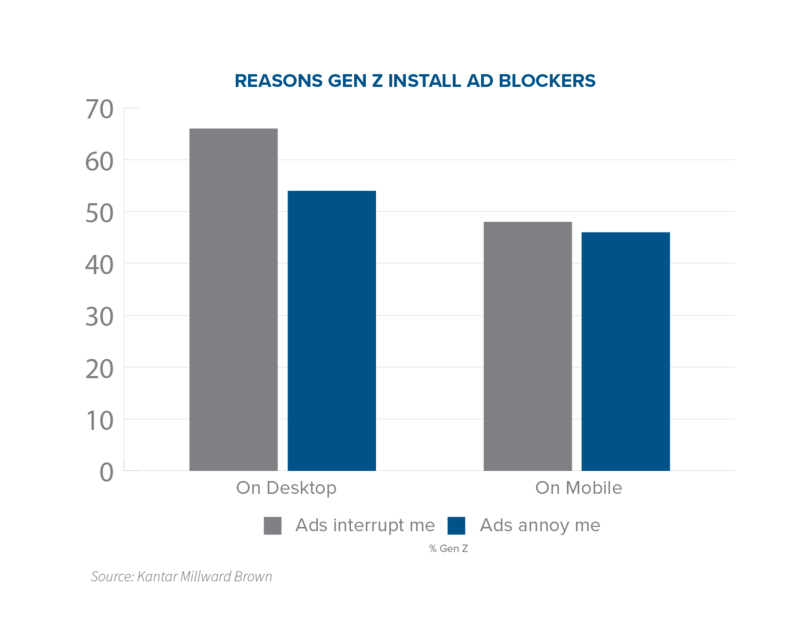 Millennials and Gen Z are among some of the most dedicated ad-blocking users on the web. A 2016 Anatomy Media study showed that 64 percent of millennials use ad blockers, while a 2017 Kantar Millward Brown study found that a majority of Gen Z users are more likely to take actions to skip, block, or avoid advertisements than any other generation. These consumers were born and raised in the digital world, so their expectations of brands are different from those of their Baby Boomer and Gen X parents. The aforementioned studies found that blanket statements and generalized messaging are not well received, because these users expect a one-to-one conversation instead. They also don’t want a recommendation for a product or service they have already purchased or never intend to purchase. Most importantly, they want to see ads at a time and place that is most convenient for them; if it is not, they will find a way to avoid it with or without an ad blocker. All of these factors ladder up to the fact that mistargeted, excessive, and annoying digital advertisements are the driving force behind the adoption of ad blockers. The perceived intention behind ad blockers is often that users want to limit the level of data and privacy advertisers can collect. In reality, studies show that only one in four ad blocking users are concerned with their online privacy. The real motivation behind ad blocking is quite different. Nearly half of the respondents surveyed in Global Web Index’s State of Mobile Ad Blocking report said they use ad blockers because they see too many annoying or irrelevant ads. 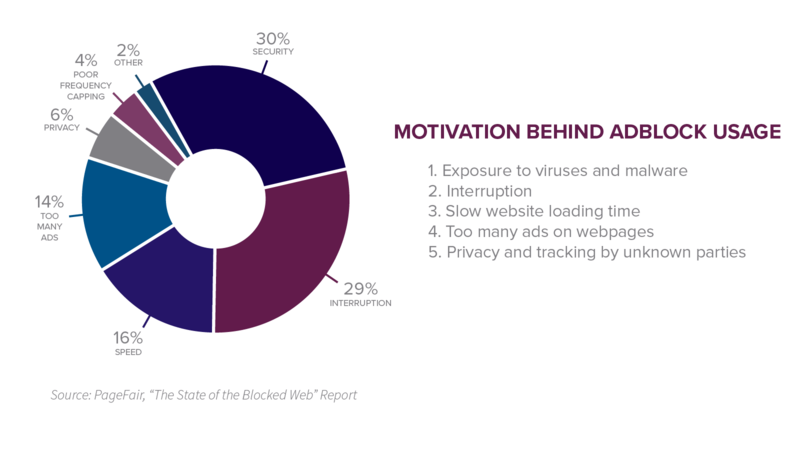 Half of respondents said they see too many ads in general, with intrusion, viruses, and load time all closely following as high-ranking reasons for blocking ads. This data tells us that Internet users do not hate ads. In actuality, they have issues with the number of ads they see and the user experience that accompanies them. Anatomy Media’s study showed that, of the 64 percent of millennials using ad blockers, less than half of those (only 31 percent) deploy ad blocking software on their mobile device. Just 14 percent of users are leveraging the software on both desktop and mobile devices. Low ad blocking adoption on mobile phones presents an opportunity for advertisers hoping to reach this audience. To reinforce this insight, data from a recent GlobalWebIndex report shows that millennials using ad blockers are actually very willing to pay monthly for content. These users are diverse and content types vary. Unsurprisingly, music and movie streaming top the list of desired monetized content at 27 percent share of usage each. From mobile gaming (23 percent) and mobile apps (22 percent), to e-books (18 percent) and learning materials (17 percent), advertisers can effectively reach millennials on multiple platforms. Another opportunity for combating ad blocking on mobile comes in the form of social media, which is heavily used on these devices. A recent Mobile Time Spent report from eMarketer found that social networking through apps is the second-most popular activity on mobile, just behind streaming audio. This is good news for advertisers, since social platforms thrive off ad spend and often focus on delivering high-quality branding experiences. The last thing a social media platform wants is to feel intrusive and irrelevant to its users. And because many social platforms are minimally affected by ad blockers, advertisers can be more confident that, beyond just being well received, their messages have a higher chance of being seen. A HubSpot and Adblock Plus research study indicates that social platforms seem to be succeeding on delivering both quality and relevant experiences, with 47 percent of respondents finding social media ads to be valuable or useful. Social ads came in just slightly behind search ads, which were listed as the most valuable format by respondents. More support for social comes from a recent research report from Defy Media, which zoomed in on young consumers’ feelings about ads. It found that 62 percent of younger audiences (defined as 13 to 25 years old) follow at least one brand on social media. Their primary motivation is to get updates on that brand, or its products and services. This adds more credibility to the notion that if the content and given environment is respectful to users’ desires, they will engage. Still, it is important to note that even when a user is not blocking ads, there is no guarantee the ads are actually being watched. A staggering 82 percent of the Kantar Millward Brown AdReaction respondents said they skip an ad as soon as possible when given the option and 51 percent use some form of ad blocking software. The most surprising result from this study, however, is that 69 percent of Gen Z users will physically distract themselves until the 30- or 60-second ad is complete. This means seven out of ten Gen Z users would rather walk away from their phone for one minute than watch an ad. Brands are now dealing with an ad blocker of an entirely different nature, and the solution to this predicament is not as easy as device targeting. So what does all of this data mean for brands? 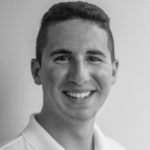 Is there an easy way to capture millennials and Gen Z users if they are uninterested? The simple answer is no. The simple solution is to treat them as individuals and to get them interested. Advertisers have just a few brief moments to capture a user’s attention before they tune out. This period decreases even more when dealing with millennials and Gen Z. The problem for many advertisers is that these two very different generations are often lumped together into the same segments. As we have seen, they behave very differently online and therefore have very different reactions to brands’ marketing strategies. While millennials may be more likely to view an ad when the time and place is right, Gen Z will do virtually anything they can to avoid ads that do not spark their interest. Brands must therefore respond to the concerns of millennials and Gen Z differently. She likely identifies more with the Instagram fashion influencer she follows rather than a celebrity spokeswoman twenty years older than her. She likely does not want a pop-up banner to load before the article she is trying to read, because even if viewability rates are highest on this ad placement, it provides a poor user experience. She likely is more receptive to an ad and closer to a buying mindset when there is contextual alignment between the content on the page she is browsing and the ads she is seeing. No matter how many times a user sees an ad, if the brand does not understand their wants and needs, millennials are unlikely to follow through with the desired action and more likely to take steps to avoid these ads in the future. Brands must show a genuine understanding of their audience before users have the opportunity to shut them down. In addition, it is important that brands make mobile a priority when targeting millennials. Mobile is no longer “the future.” Mobile is at the forefront. 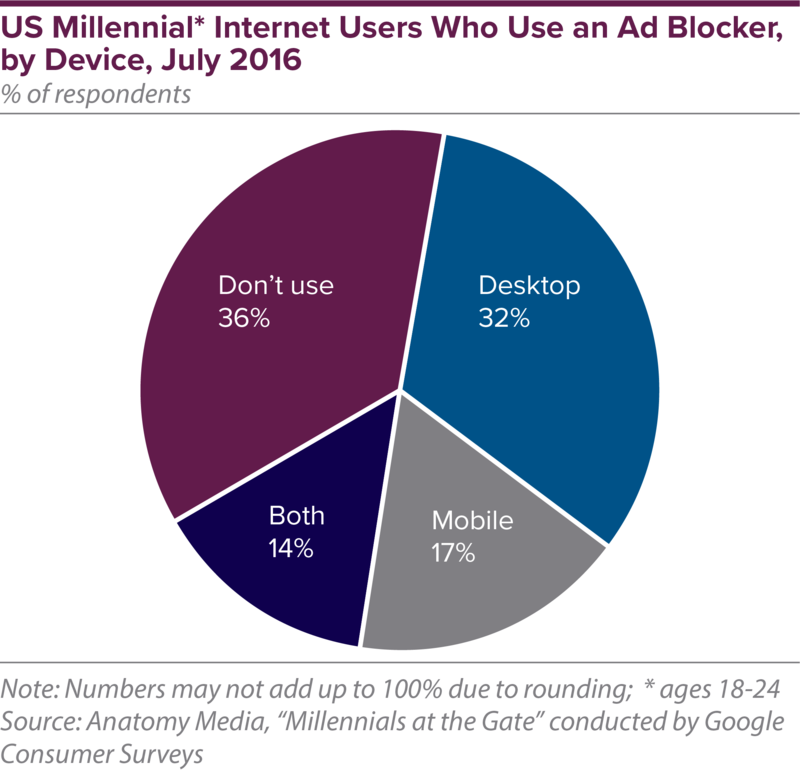 Brands should capitalize on millennials’ low mobile ad blocker adoption and dedicate specific budget to mobile partners. Evaluate what type of mobile placements your brand is buying and consider if they really provide a positive user experience. Look less at historical data from a campaign that ran three years ago and more at research released on audience behavior and intent this year. The saying “if it’s not broken, don’t fix it” does not hold true in an industry and with an audience that experiences such rapid change. Advertisers’ approach to Gen Z should be similar to millennials in the sense that brands need to consider the user experience, but different in the sense that this generation is not as easily satisfied with the “right time and place” model. While millennials want ads that make sense to them, Gen Z wants content that entertains them. This generation is more likely to walk away from a device to avoid an ad. In this case, the solution is to develop a message that speaks directly to a Gen Z user. Studies like the aforementioned AdReaction from Kantar Millward Brown show that this generation prefers humorous commercials and videos that are less than ten seconds long. They also like to engage and co-create with their favorite brands. These insights tell advertisers that they should treat ads targeted at Gen Z like content, not like ads. With this in mind, it is important that brands remain authentic and genuine. This requires brands to both understand their audience and understand how their audience sees them as a brand. Riding on the coattails of the latest meme, street slang, or viral video does not work for all brands and Gen Z users can and will see through this false authenticity. If a message feels unnatural to a user, they are more likely to avoid the ad. If the message feels like content they see on their social platforms, they are more likely to engage. On Snapchat, it is important that the brand is immediately recognizable and the message is quick to catch a users’ attention before they subconsciously tap through. When running incentivized video, it is important that the first few seconds are intriguing enough to motivate the user to watch the remaining 25 seconds, instead of putting their phone down to distract themselves. When running video in general, it is important to consider what placements Gen Z finds intrusive and disruptive. According to a recent study by IPG Media Lab and YuMe, only 17 percent of mobile device users feel a preroll video ad is intrusive, compared to the 60 percent and 72 percent that feel outstream and midroll are intrusive (respectively). Making the ad appear seamless with the content being viewed is at the top of Gen Z users’ priority list, and brands that create content-like ads will succeed in the long run with this generation. The most important takeaway from the research on millennials and Gen Z is that regardless of behavioral differences, media usage, and software adoption, the user experience remains the single most important factor of an advertising campaign. A positive user experience leaves users feeling important and understood by a brand. This mutual understanding fosters a positive relationship with the brand that will prove to be useful as the industry, technology, and audience expectations continue to evolve. Advertisers that deliver on that, in the most relevant environments, will have better success combating the issues of ad blockers and ultimately winning the loyalties of their key consumers.